As London enters deeper into the winter months and temperatures start to dip, I find myself turning to the chilli-based recipes of home for warmth. One such dish I often fall back on is my family’s ‘Mee Siam’ recipe. This Siamese-style noodle dish is a family staple that my godmother has been cooking up ever since my childhood days. Inspired by flavours from neighbouring Thailand, the unique spice paste is made from a blend of fermented soya bean paste, chillies and lime juice. This is one recipe you can adapt based on what seafood or vegetables you have available in the fridge and store-cupboard (it’s one of those easy-come, easy-go recipes that would work just as well with chicken as it would with any kind of seafood you fancy). Don’t mess about with the spice paste though… it’s the key to this dish. Spicy, tangy and with a great depth of savoury flavour it’s a rockstar of winter warmer that’s dead-easy to make and sure to be a crowd pleaser. Peel the prawns and set aside. Reserve the prawn shells and prawn heads and simmer in 250ml of salted water for 10-15 minutes to make a shellfish stock. Strain the shells and heads and reserve the shellfish stock for later. Add all the spice paste ingredients into a food processor and blend to a fine paste. Add about a tablespoon of oil to a flat frying pan and make a thin omelette for the garnish. Once cooked, fold, set-aside and slice into thin strips. Add the prawns and fry briefly for half a minute on each side. Before it’s fully cooked, throw in the vegetables and cook for a further 1 – 2 minutes. Add the vermicelli noodles to the pan and mixing thoroughly with the prawns and vegetables. Add about 150ml of the shellfish stock made earlier and cook for a further minute or 2-3 minutes until the noodles have soaked up the liquid. The aim is to get a noodle that is relatively dry, but still moist to bite. Add half the picked crab meat (reserve half for garnish). Taste and adjust the seasoning with fish sauce and palm sugar to taste. Keep warm off the heat. Garnish with the sliced omelette, crab meat, lime wedges, red chilli and chopped coriander / spring onions. Wow ah koo yor mee siam is better than Dorothy’s (ah mah’s usal caterer) LOVE ARIS AND AH BEET. @Aris: The recipe worked out really well! As nice as the one poh poh and ah mah usually cook at home. 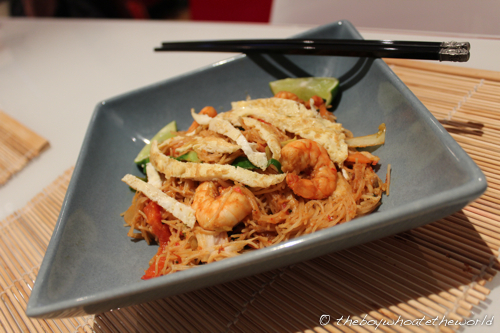 Your mee siam looks delish, think Bee at rasamalaysia would be proud of you! Eleanor: Thanks! You’ve just reminded me how much I miss Mee Siam. Going to make sure I stock up on a couple bottles of Taucheo next time I’m in Chinatown so I have it in the store cupboard ready to go! I tried making dry mee siam from one of the recipes on the web but it did not turn out as good as I hope. I am going to try making your version of dry mee siam. Can’t wait. Did you use chilli padi or the normal red chilli? @hungrygator: I used just normal red chillies. 5 chilli padis would be overkill i think =)!